Back in December 2014 I supported a Kickstarter campaign called Fireteam Zero on a whim, and I’m happy to report that not only is the core game finally here, but the expansions are on their way soon. It’s taken a little while, but newcomer Emergent Games has delivered an attractive package of alternate-WWII/horror, with some suitably scary (if a little bit soft on detail) figures and nice design. Oh, and a CD – a CD? … never mind, digital downloads are available from the website – which narrates the mini-campaign beautifully and adds evocative background music, which is a nice touch. There’s nothing particularly revolutionary here, but the elements come together with gusto, evoking games such as Doom: The Boardgame and Gears of War (the game uses the latter’s ‘cards are your hit points’ idea). Your squad members have separate decks of cards with different specialised tactics, which adds a fun layer to the proceedings. Be prepared for a rough ride though; the beasties spawn at the end of every turn and their AI generally consists of charging at you and eating your face, so the combat is relentless. While you’re fighting them off, you’ll be searching areas in an attempt to achieve a sequence of objectives. I look forward to checking out the expansions to see if a bit more variety has been introduced to the core concepts, but if not, there’s still a lot here to enjoy for fans of the genre. @UH: Many thanks for doing these summaries, as usual. I just received Wave 2 so decided to re-start my FTZ games using the bonus minis. It would help tremendously as I don’t play the game often enough to be conversant with all these, so any little bit helps. Fireteam Zero back on kickstarter for a second printing and I missed it first time around. Is it worth throwing some money at? I’ve enjoyed it a lot the few times I’ve played it, though I have enough to go on for a long time (the core game and two expansions) and won’t be backing the extras this time around. It’s fast, thematic, kill-the-monsters fun, with some enjoyable card management and, since you can play cards to help your teammates, a lot of player interaction. The figures aren’t absolutely top quality, but they do the job. It won’t be adding a new genre to your collection or anything, but it’s worth having in my opinion. I can pick it up in UK for around £60 for core set. It’s minus the stretch goals, but I could always go for addons option in the new KS. Fireteam Zero arrived today. That’s a big box… with an insert that has potential to hold few extra bits. My plan is to get a game, or two in (probably solo) before the reprint ends on KS. If it’s good, I’ll pledge for some of the extra missions that are available. Of the addons in original KS, what would you recommend? Europe and/or Africa Cycle? Fireteam Echo and/or Delta? Team Challenge and/or Team Competition? Mission Generator (presumably random missions)? One or both the expansions (they play differently so read the KS description to see what style of gameplay you prefer). Personally, I’m getting the Europe expansion (only) and monster box A and/or B. If you get the $50 pledge level, you will get the stretch goals for free which are monster boxes C and D. I’ve got the Mission Generator and it’s worth it. This is of course my personal assessment and YMMV. Africa adds Gear which has a certain appeal. Not sure and Europe and the Specialists stuff. Need more info really. The Mission Generator seems an essential. The new Recon and Harbinger decks seem interesting, but the latter works best with Monster Packs. The Monster Packs appear to be designed to make the game more difficult. Do you have either Echo or Delta team? Are they different enough to core team to add replay value? I think you should play a few games of the FTZ core box so you can better gauge if you want the variety different character skills can bring. Or you want the variety from different missions and monster boxes. (Or both ). Played the act 1 of scenario 1 solo (with two characters)… twice. First time it went really badly. Second time just badly. Maybe I wasn’t using reaction enough, but it does seem harsh that at the end of every turn, all the monsters I just killed are re-spawned… That is right isn’t it… move the monsters then put all the ones in the spawn pool back on the map in random locations? Doesn’t mean I don’t like it, but it may alter my plans for buying addons from the second printing as it seems hard enough without extras from monster packs. Try another scenario, the first one in a game is always a dud! I didn’t really click with this game until I tried another one, and it was better with more players too. I will play multiplayer at some point, but we only get together once a week and that’s normally RPG night. I find the solo rules usually give me a feel for the game. This is one of those rare occasions where I don’t agree with you – I don’t think you get the feel for this one until you’ve played it multiplayer, because there is so much co-operative card play. I tried it solo a few times and was unimpressed. Playing with 5 people was completely different. Five? Is that with an addon? Core only includes 5 heroes and 2 are leaders, or which can only play one. Apologies, must have been 4. Keeping track of two hands of cards with the Attack/Reactions plus the Tactical Responses and any monster special abilities did require some effort. 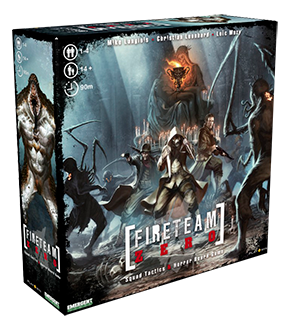 Only 6 days left of Fireteam Zero and I’m not sure it’s worth $50 (plus $10 postage) to get the stretch goals and $50 worth of addons for the game. The Mission Generator makes sense for extended replay, well it did until UH mentioned that the solo play option was a bad idea. My concern at the moment is that the limited monster types will get a bid dull playing the campaign. Do the stretch goals add much to the game? Or would I be better off buying Africa Cycle and/or Europe Cycle? I wish I could help but since I’ve only played about three times I don’t know what to advise! The Stretch Goals add monster variety. They are basically the Monster Packs C and D (IIRC). I’m personally getting the Europe expansion + Monster Pack B (neutral monsters for more variety). Maybe the 2 new card packs. Caveat : I mostly play solo with all 4 characters. I’ve only played first mission solo, twice. Keeping track of two characters was a bit of a pain. Not sure I want to do that with four players as a lot to keep track of. Thematically I like it, but not sure I should invest more money in it, as I’m still buying everything Imperial Assault throws at me (and waiting for the solo/coop app they promised last year). If first mission a bad example? Should I try something else? Only 3 days to decide. I think there updates on this KS are very poor, one when they funded and nothing since. In my mind that shows disinterest in their own product. I know it’s only a reprint, but still… one update makes it look like a cash grab. I’ve already said this somewhere but the first meission is not the best example, and this game really shines non-solo. Everyone making their own decisions about which of their cards – which are their life – to help you out is what makes the game shine, IMHO. It’s a reprint, I don’t think they‘re doing the hard sell on this campaign. I’ve exchanged a few emails with them in the past and they seem like genuine people. It’s a good, solid, fun game – probably nothing that will blow your socks off with its originality, but fun. It was in this thread you said that UH… sorry… I was asking CK really as he’s played it solo a few times. Hope you at least pledged $1 so you can get access to the PM. As I’ve said, I’ve only played with all 4 characters. The game does scale, but it’s all about finishing the mission, not killing monsters. Because they always re-spawn. So as UH said, it’s all about team support. The times I’ve had my characters go on solo runs… I’ve always regretted it. So if playing multiple characters is not your thing, best not to get too deep into the game and just enjoy the core, for those times when you can get a gaming group together. @CK… we all have life getting in the way at times. I backed it, but dropped out. Decided I didn’t need more. So much stuff I’ve not used. Maybe I can pick stuff up at retail like I did the core game. @8th : yeah, there’s not all that many KS-exclusives if that doesn’t bother you. And the retail price will probably be a bit cheaper too. The only reason why I’m backing the KS is shipping. Any savings I’ll see by buying retail will be gone thanks to shipping.